Once the jolly season is upon us we all want the option to make the Easy Christmas Card ... especially if we have lots to make. Maybe you make them for a charity that you support or perhaps you have a small card making business. And maybe you don't have any of the fancy equipment that is on the market and so doubling your work load. But if you do have lots to make then this could be a really good idea for you to try. 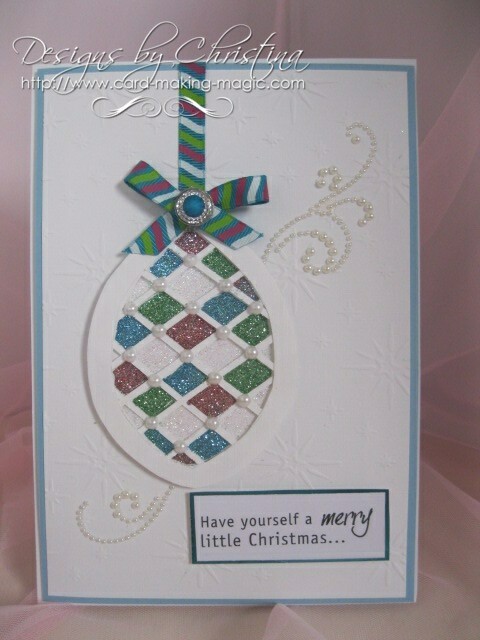 Over the past few video tutorials I have covered making Christmas cards that are pretty and all are simple to make. But I have also covered cards that don't use these or any other dies ... Christmas Bauble Card was one. And this is another variation ... and not a Spellbinders in sight !! This pretty design is a good way to use up all your odds and ends of glitter and ribbon. I have chosen my colours from those in the small piece of ribbon that I wanted to use. Maybe you want to keep it all one colour and each colour glitter will give you a different look. You could match them to the colour scheme you have chosen for your Christmas theme. Try adding it to some Mirror card if you preferred... or any of the specialised card that is around. You could also try altering the way you lay the thin strips down to create yet another look. I have added pearls to all the cross sections on my ornament. Have fun with your creations and see what you come up with ... but this is certainly a very pretty way to send those greetings to the people that are in your life.